This experimental interaction design in javafx for deepamehta will reach its official end of lifetime in late 2012. All metadata in the library accumulated until then, will be kept. This is the page of a collaborative audiolibrary based on deepamehta4 for associating sound resources from various audiolibrary resources on the web. It allows everyone to query and pick streams of sounds from soundcloud.com, from your favourite artist on bandcamp.com, curated by the freemusicarchive into one "playlist". Or better said, into one finally played along track, calculated on a possibly given interest between n-connected songs, after any played sound, because playlist does not really nail it here. The played along tracks are basically in collaboration created arbitrary associations, layed out as a network of possible choices between all sounds on the web and stored in form of a metadatabase, like this deepamehta plugin provides. Furthermore one can annotate sounds (=index any "Soundstream" with a "Note" in DeepaMehta as a timed comment) with this player filled up with the available metadata on the given stream, e.g. which song is currently played in your favourite webradio. Technologically this software is written in JavaFX 1.3.1 and runs fine on all operating system running with a jre, with an incredible amount of support by the awesome gstreamer multimedia lib + gstreamer-java. The collaborative and associative audiolibrary`s data model is based on the DeepaMehta3 and its Audi0-Canvas Model plugin. Read more on its interface concepts in this blog entry. For installation description, change history and more, read the lower part of this page. The open source multimedia libraries named gstreamer for your operating system. If you are using Ubuntu, you don't need much to do at all, most of the sound resources should run fine out of the box. If you need something just use your package manager of choice and install everything you like with the name "gstreamer". If you are running onWindows, you can grab and install the necessary program after downloading it from ossbuild site, though some users reported some trouble while trying to get it running on Windows Vista and 7, just XP is reported to. As a Mac OS X-User, check out this page or download or use our mirror of his gstreamer-build to install the package. For more information on the release history, please visit the project page. What it does, it enables you to express a 'thought connecting sounds', take timely notes on your sounds and share all this with others. Double Click on an item which represents a sound resource allows to "play" and "pause" it. Right Mouseclick "enqueues" and "dequeues" sound resources which are played right after an active sound ended. Right Mouseclick followed by a Drag on an item allows to "link" items on the canvas together. Alternatively you can also press CTRL + Left MouseClick + Drag to link multiple items together. Hint: Pressing SHIFT on your target item allows you to continue linking, that way you can layout real TRACKS without a pain. You can create a "Note", like a timed a comment, at any time of the sound and navigate it in your map, just type it into the corresponding input field at the top. You can create your own Maps via the "Create Map"-Command in the Extras-Menu now. Wohh, and hey, check out the Keyboard Control: Space Bar = Play/Pause, ALT+TAB=switching focus between items, f=forward, r=rewind (if latter is supported by the streaming server). Load all the topic maps from either new http://deepamehta.newthinking.net/rpc/soundsets or your localhost Soundset service and serves you the interaction on available sound resources as stated above. It stores new "links" as relations of type "SET" and allows the player to play along those, depending on if some links are selected or not, prioritizes paths through your network of sounds. Enables you persistent organization of all your topic maps, which means: when you get back to work in your full fledged deepamehta3-client the view will look like you expect. Ah, and for sure, lets you annotate your sound resources while you're listening to them. For any complete feature description please read through the release history below. If you want to give feedback, i just setup this simple feedback form for that purpose. There is also another interface running on this service and you can use it for giving us your feedback in a Note. If you feel like a hacker today, you could even leave us your favourite WebStream URL as Path in new a File-Topic. This is our browser based interface and it shows exactly the same maps and sound resources like this rich-multimedia-interface but it does not have a special audio-player implemented yet. If you have already your personal DeepaMehta3 installation with the Audio-Canvas-Model Plugin up and running, you can also choose the local Soundset Service in the Extras-Menu of this Application to connect to your personal Soundset Server without needing to restart the application. If you want to install your personal DeepaMehta3 Soundset Server. You can use the following deepamehta-gogo-shell-command to do so. Everything is compatible with the end-user release in v0.4.2, hence this version name. All you need to do therefore is, enter the following command into your deepamehta3 console then everything will be fine. What this plugin does exactly is, it extends all File-Topics to give us some place to store certain music-related meta data. This is mainly used for visualization purposes, for example, to visually distinct between a sound resource coming from soundcloud, one from your hard disk and a web radiostream. The follow ups of this relase will take care that you don't lose any of your carefully aggregated and interlinked sound resources from all over the net. ADMIN / 06.03.2012 - 09:00PM: re-deployed application to run on http://deepamehta.newthinking.net after new website launch..
ADMIN / FIX / FEATURE: 16.08.2011 - All distributed launch files should work again. New touch- and plumber-style triggers on circles should make it easier for users to start associating topics. ADMIN / 17.03.2011 - Due to some refactoring you can't continue using the launch file you may have stored on your desktop. Please download the freshest launch file for your system. FEATURE / 04.03.2011 - Introducing any "Sound Resource" is allowed now and you can do so through using the new "Item-Selector" at the upper left, just be aware that you have to use a definite streaming url which delivers the stream in a popular audioformat; Since FreeMusicArchive's streaming url's change every day, the necessary extra query to the fma-server is now a visible process. 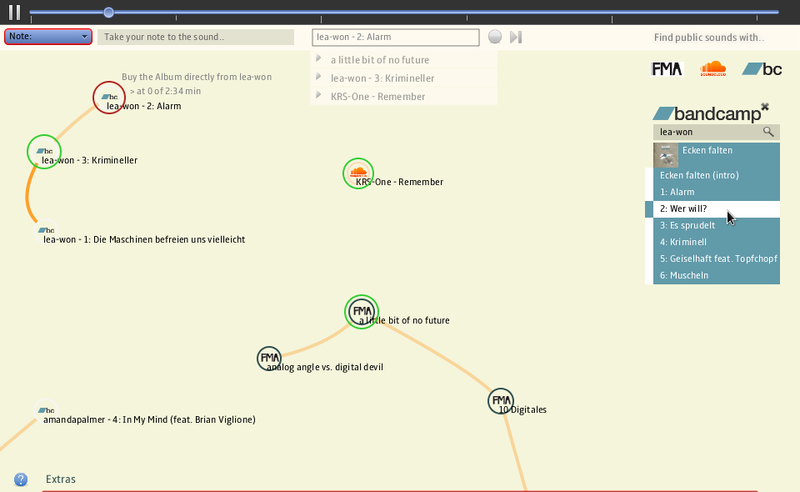 FEATURE / 22.02.2011 - 04:13PM: There is a Bandcamp*-Album-Query Dialog available now, though it just reacts if you enter the exact subdomain of the bandcamp user; You can now create and name your own maps via the Extra's-Menu.